Displays or hides components' description in a graph. If Display default component description is disabled, only user-defined description is visible. When Show component description is enabled, it shows the components' default description (e.g. path to the file in Readers or Writers). 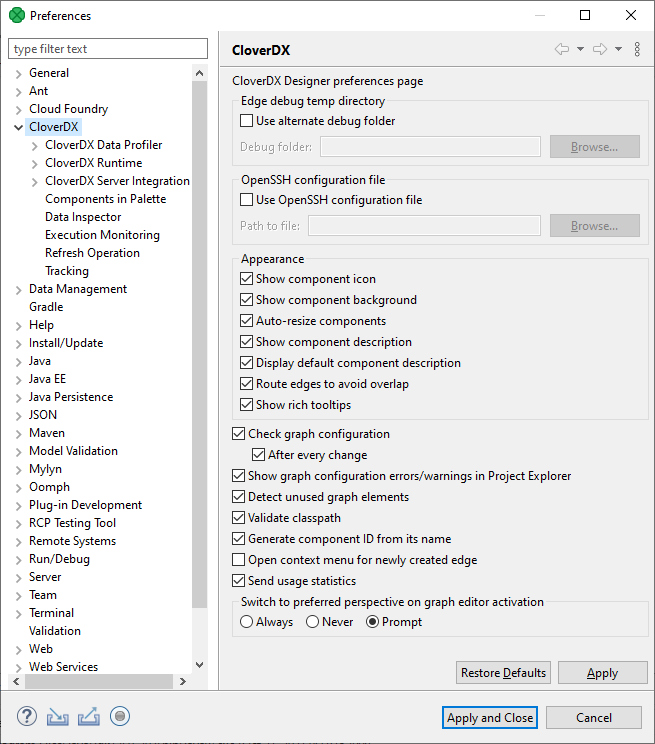 Enables or disables graph configuration check. Without checking, errors on components are not displayed. Enables or disables updates and reporting of used/unused graph elements. Disabling can solve some specific performance issues. Checks whether the content of the classpath file is valid for both Designer and Server. Can be disabled in case it significantly slows down the working process (opening new projects, etc.) or indicates false positives. Opens the context menu after creating an edge between two components. In the menu, you can select metadata for the edge.